If you read the box, it says for ages 8 and up. However, if you are a writer, this game is for all ages. This game is all about creativity. I love games and exercises that put a constraint on the writer. How you deal with constraint as a writer is fascinating. Some people fight against it completely and others find a way around it to do something glorious. This game with stretch your imaginative muscles. Here’s the gist of the game. You have a box of cards. Each card has one word; either a noun, verb or adjective. You flip over 5 cards randomly and you have to use those 5 words in a single sentence. who was notorious for fogging up the glasses of passersby. I’ll bet you anything yours was completely different from mine and probably funnier too. My writing group has played this game twice and each time I wonder if I could turn one of my sentences into a picture book. You’ll certainly make a few inside jokes. Need something more challenging? Try 6 cards. Or 7. Nice review. 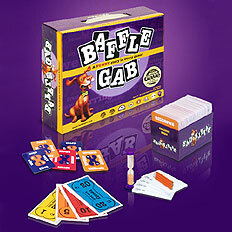 The game sounds like lots of fun and a great stimulus for imagination. Thanks for sharing. I may just have to make a trip to the store or ask for this on my birthday. Great review!